Kate Greenaway, Randolph Caldecott, and Walter Crane are generally considered to be the most important children’s book illustrators in Britain during the second half of the nineteenth century. In their biography of Greenaway (1846-1901), Spielmann and Layard state that, in spite of her illness in the last year of her life, “she was full of schemes for books—not merely projected schemes, but plans fully matured, first sketches made, and pages fully ‘set-out.’” Among these “was a new Blake’s Songs of Innocence, to be published at a shilling net, each song with at least one drawing; this was so fully worked out that for certain of the designs several sketches were made.”1↤ 1. M. H. Spielmann and G. S. Layard, Kate Greenaway (London: Adam and Charles Black, 1905) 251. It is unlikely that the project ever went beyond the sketching stage. There is no edition of any work by Blake listed in Thomas E. Schuster and Rodney Engen, Printed Kate Greenaway: A Catalogue Raisonné (London: T. E. Schuster, 1986). I have not been able to locate any such sketches by Greenaway illustrating individual poems in Blake’s Songs of Innocence, but I reproduce here what I believe to be her design for the projected book’s front cover, dust jacket, or both (illus. 1). The center of the vignette apparently pictures two seated figures facing each other. They are as minimally represented as the border, but would presumably be developed in more detail in subsequent drawings. Behind and slightly overlapping the back of the figure on the left is a capital “B.” Greenaway probably began to write Blake’s name in this space, and then changed to the name above with the two figures in the vignette. Three facsimiles of the Songs, including William Muir’s of 1884, had been published by 1901, and thus Greenaway need not have had access to an original copy to have been influenced by the leaves, vines, and grape clusters pictured in Blake’s designs for “On Anothers Sorrow,” “The School Boy,” and both plates of “The Ecchoing Green.” Electrotype reproductions of three of these plates, absent only the second plate of “The Ecchoing Green,” were also available in Alexander Gilchrist’s Life of William Blake, 1863 and 1880. The human figures are less easily related to Blake’s imagery. The closest parallel is the two very small figures, seated on a tendril and facing each other, below the second word of the title to “Nurses Song.” None of these similarities is sufficient to prove that Greenaway was responding to Blake’s own illustrations in Songs of Innocence. David Bindman gave me the drawing in 1980. It languished half-forgotten in a drawer until a house cleaning returned it to notice in February 2005. 1. Kate Greenaway. 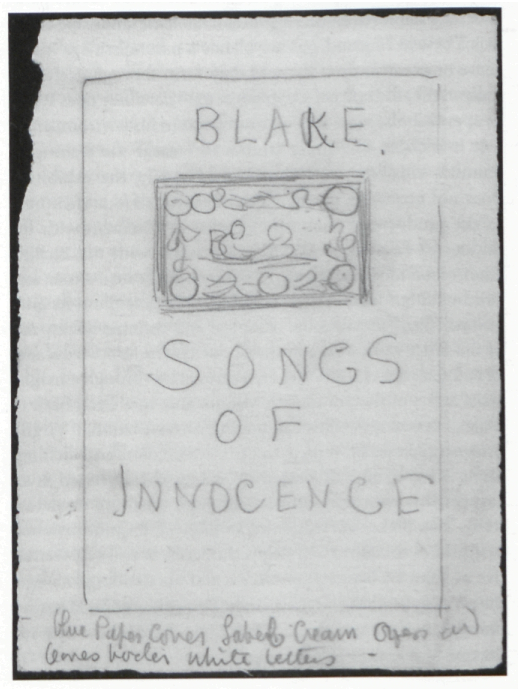 A Cover Design for Blake’s Songs of Innocence. Pencil, 17.2 × 12.7 cm. (including the inscription at the bottom), on cream-colored wove paper without watermark, 19.2 × 14.2 cm. Datable to 1901. Collection of Robert N. Essick.